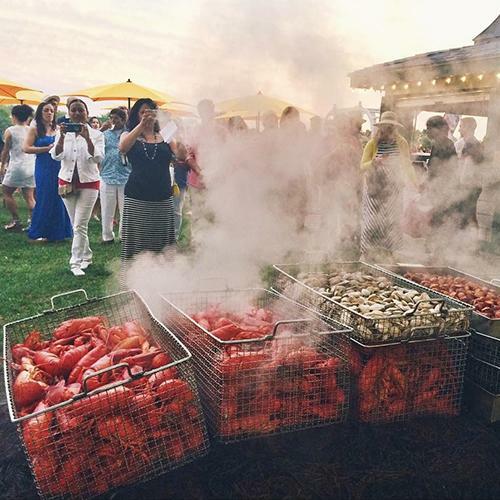 A traditional New England Lobsterbake will round out the gala weekend at the conclusion of USA vs. South Africa. The freshest local seafood & produce will be cooked to perfection field-side by McGrath Clambakes over hot coals under a bed of fresh, local seaweed. This tasty and fun annual Polo Series tradition sells out each year and is not to be missed. Tickets* $60 per person, available online until July 31, while supplies last. Cash bar. Polo match tickets sold separately. *Must present ticket at time of service; Tickets are for individual dinner portions per person. The meal will be served buffet-style at the polo tent, in the Pavilion, immediately following the trophy presentation. This is NOT an unlimited buffet. Refunds must be requested in writing by the customer, via email, at least 7 days prior to the ticketed event (by noon on the previous Friday) sent to: agnes@nptpolo.com. RAIN DATE: In the event of the postponement of the August 3rd polo match prior to its start, (due to weather/field conditions), the Apres Polo dinner will remain on schedule for Saturday, August 3rd at 7:30PM. For more details on our ticket policies, please follow this link. In the event of inclement weather, always check the Match Status recording on our Info Hotline (401) 846-0200 x2 and our website, nptpolo.com for Alerts, both of which are updated with any status change for the impending match.